Glass beads and bangles were being made by humans as soon as they figured out how to melt sand into glass. Glass is a combination of silica (sand) , soda, and lime. The earliest beads consisted of a glob of melted glass wound around a clay coated rod. This was twirled about until it formed a fairly round bead. That was then slipped off the rod and allowed to cool slowly near the oven where the glass was melted. In some cases it was shaped into other things. The earliest glass objects that have survived to the present day are small objects like vials for perfumes, pendants, and of course beads. We don't know when or how it first started but archaeologists have found early production sites throughout the Middle East. As early as 2400 BC. glass beads were being made in the Caucasus and Mesopotamia (modern Iraq and Iran). Within a few hundred years they were being made throughout the Mediterranean, India and Europe. Some of the earliest known beadweaving comes from the Old Kingdom period (2200 BC) in Egypt, naturally enough it is a scarab similar to ones seen in the Harlequin gallery. Archaeologists have found that early glassmakers were working as professional craftsmen in well organized production centers. They were making glassware like goblets, pitchers, plates and platters. Small vials and pots for cosmetics were also popular. At this time glass was a rare and costly luxury and most glass objects were found in palaces and temples, only rarely in private homes. Only the and powerful could own glassware. Some artisans were specializing in purely ornamental forms of beads and bracelets. This specialization led to experimentation. Egyptian "crumb" beads were made by fusing crumbs of multicolored glass onto opaque black glass beads to produce brightly speckled beads. These date to around 2000 BC. Nearly as old are "Eye" beads made by placing drops of colored glass onto newly formed beads to create spots of color or eyes. These were used as amulets to keep the 'evil eye' away. Glass beads were made to imitate different stones too. Red beads were made to look like carnelian or blue beads could be used in place of turquoise or lapis lazuli. By Roman times, around 200 BC, glass making was a common industry and specialized factories could be found throughout the roman world. Several shipwrecks have been found to contain broken glass and glass ingots as both cargo and ballast. Glassware had become a common commodity and was no longer a luxury item. Glass was being imported from one end of the Mediterranean to the other so beadmakers and artisans could have access to a variety of different kinds of glass. Much of this was based on Egyptian and Phoenician glass makers on the southern side of the Mediterranean and Syrian glassmakers working in what is now Lebanon. One legacy of all this commercialization was the Venice bead factories. 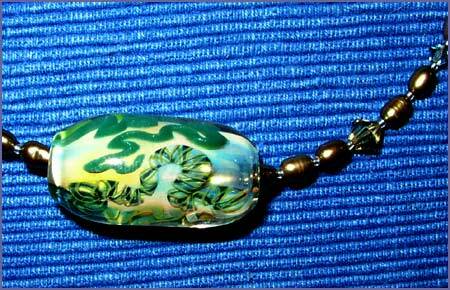 Venetian glass beads were and are still famous for their exquisite and intricate use of colored glass. They have experimented and specialized for hundreds of years Artisans there are making millifiori beads to delight the eye. These may be based on mosaic beads made in Alexandria that date to 200 BC. All techniques that have been used for thousands of years and taken to new heights by these talented artists. Third World Beadmakers by Peter Francis Jr.